Donald Cant Watts Corke (DCWC) engaged IA Design to re-establish their presence in the Perth market following a relocation to Perth’s CBD. The scope was to create a bold, contemporary and tasteful office environment that would impress clients and visitors. The new fitout embodies their mission statement of being “Partners of Excellence” and resonates with the DCWC brand. 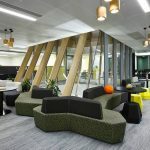 The fitout was successfully designed to cater to the style and aesthetic preferences of the board of directors, whilst accommodating employee and client needs. The new space provides employees with an adaptable environment featuring a bright breakout space and electric sit-stand workstations throughout. 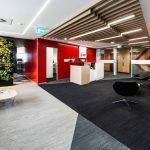 With multiple client-focused spaces and the flexibility to accommodate internal events and larger functions, the new Perth DCWC office has delivered a future-forward solution that ties in with their national identity. IA Design successfully delivered this project under a tight timeframe and within budget.